When child get the opportunity to play outside, it helps them develop so much more than when they are indoors, in a ‘clean’ environment all of the time. Playing among flowers or in a sand box encourages perceptual development. Perceptual development is a person’s ability to perceive through their senses, like smell and touch as well as hearing, seeing and tasting. Listening to the wind or the birds singing, feeling sand between your toes and smelling the flowers are wonderful ways for children to develop their senses – perceptual development – and learn about the world around them. The Blue Bird Castle is a fantastic cubby choice for nearly any type of child. This is a standard sized structure that is built up on a small stilts. The cubby can be entered by using the three step stair case in the front or the ladder style staircase on the side. The large windows that are built into the cubby allow the inside to stay fresh. The covered area beside the house can be used as a sandbox or other type of play area. This is a great space for children to play outdoors under a covering… read more. 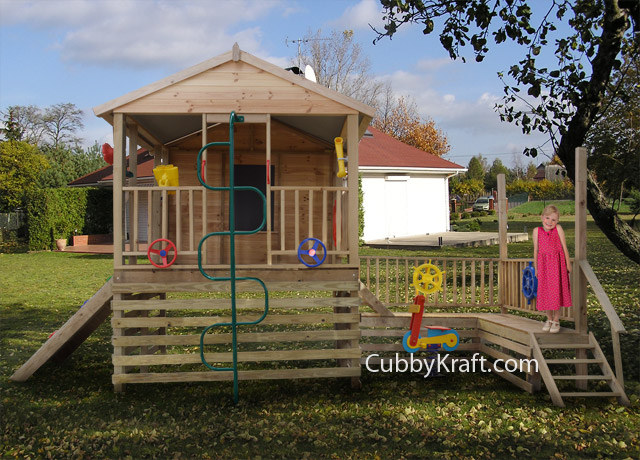 Is your child ready to climb into a grand adventure with a cubby fort outdoor toy? 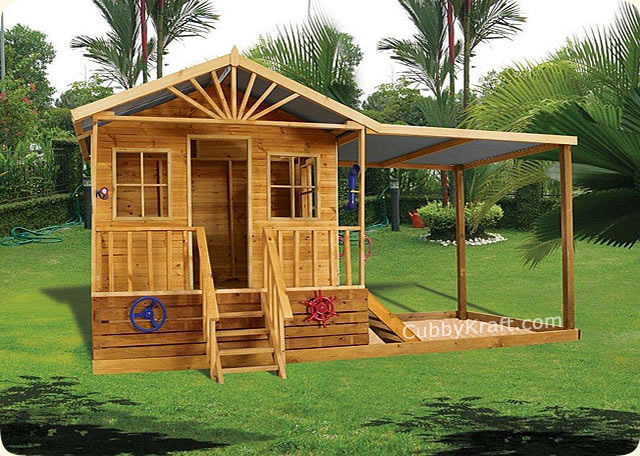 Because that is what they will find when they see this CubbyKraft cubby fort in their own back yard. The Kidsworks Park cubby fort is a high fort arrangement with two elevated levels that encourage your child to climb up into the open structure of the fort to play. From there they can climb down the attached hand railings. Or they can go the other way with this outdoor climbing toy and climb up into the cubby fort using the rock wall and then come down by the stairs. Either way, they are using these outdoor toys to get some serious exercise… read more.